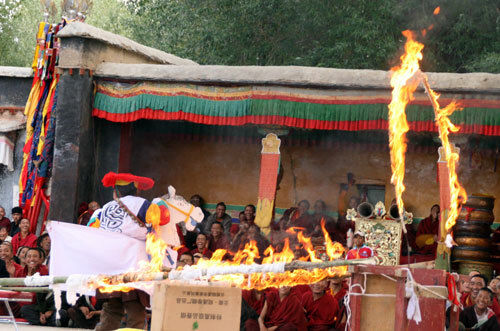 This series of photos was taken during a Tibetan Festival in the Tashilunpo Monastery in Shigatse, Tibet. 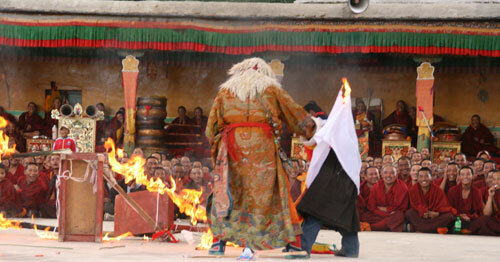 A group of young children were dressed up as white paper horses and led around the square in the front of the monastery by a pair of Tibetan clowns; two guys dressed in animal skins with shaggy white wigs and red masks who built an elaborate contraption with a hoop at one end and set it on fire. Finally, the children had to jump through the ring of fire. Unfortunately, the last child got himself hooked on the hoop and his costume caught fire. 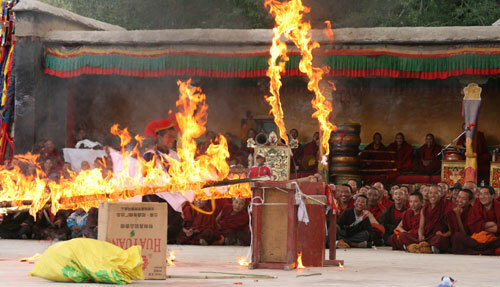 For a brief moment I feared the worst as he was engulfed in a ball of in flames. 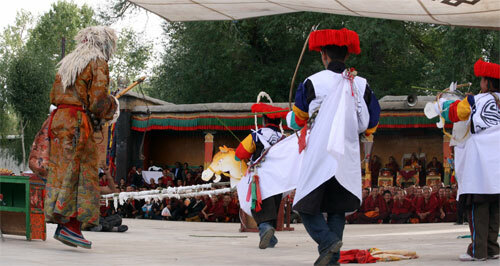 My anxiousness must have been down to that overly western obsession with children’s safety, for the rest of the crowd, monks included, were all rolling around on the floor in a fit of hysterical laughter. Of course nothing happened, and the poor boy was left to face the ridicule and jokes of his mates. Accommodation and Food: We stayed at the Shigatse Post Hotel, a new-ish place right opposite the posh Shigatse Hotel, down Shanghai Lu. Our double room was painted and furnished in Tibetan style, complete with thankas and white ceremonial scarves, all very bright and clean; good value for 180 Yuan. Going down Shanghai Lu towards the centre we found plenty of food, though restaurants were mostly of the simple, snack food variety. A ten-minute walk from the hotel will take you to the night market. 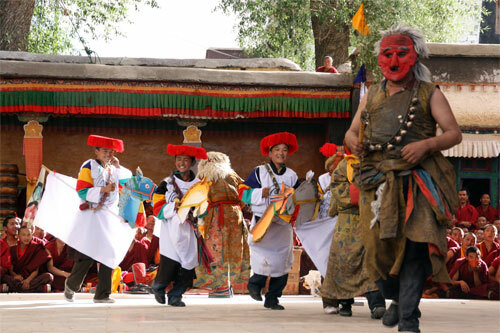 Festival info: We were in Shigatse on September 15 (2007), but we have no idea whether there is a fixed date for the festival, or whether it is related to the lunar calendar. We never even found out what it was called; any clarifications are welcome! Amazing. Words cannot describe it.